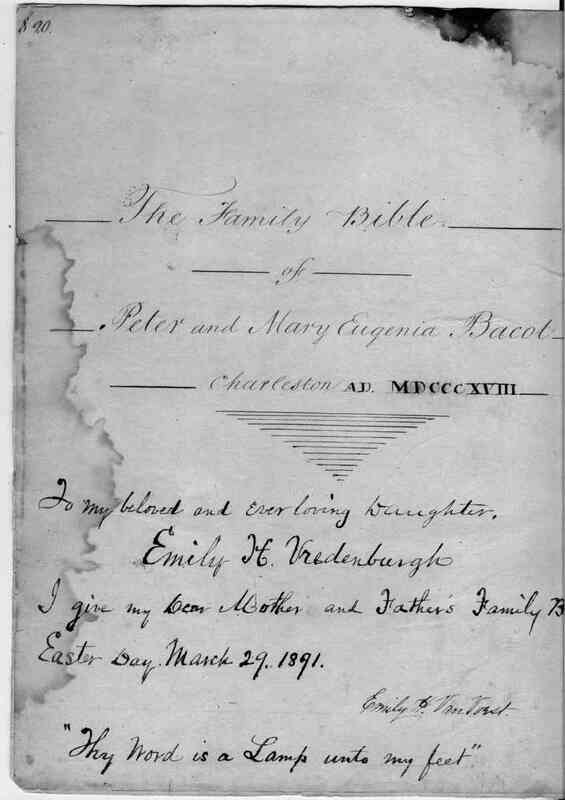 Bacot Family Bible of Peter and Mary Eugenia Bacot, ca 1818, Charleston, SC. 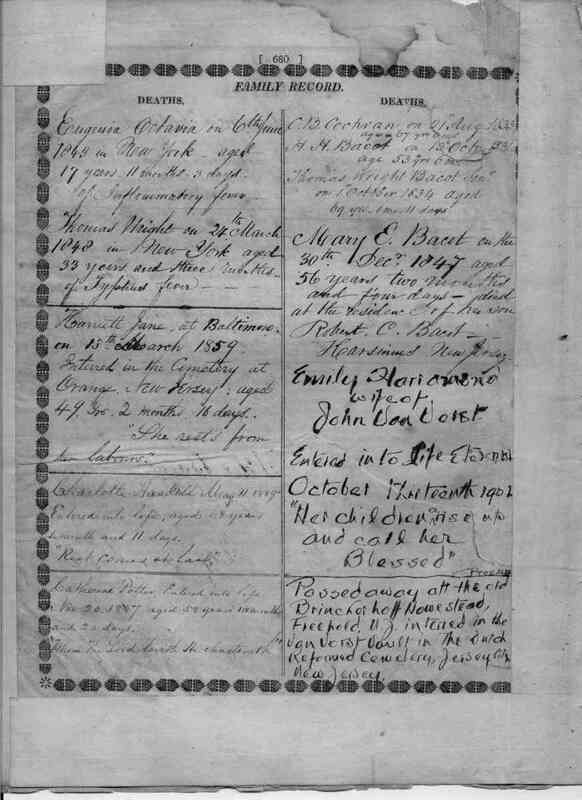 The following is a transcript of the "Family Records" pages of the family Bible of Peter and Mary Eugenia Bacot, ca 1818, Charleston, SC. Peter was the eldest son of Thomas Wright Bacot (son of Peter Bacot) and Jane (DeSaussure) Bacot, daughter of Henry DeSaussure. Mary Eugenia was the eldest daughter of Charles Burnham Cochran, (son of Robert Cochran) and Harriett Rachel (Thomson) Cochran, daughter of Col. William Thomson of BelleVille S.C. It's a treat to see the elegance of the hand that wrote most of the entries and poignant to see the changes to that hand over the decades; recording the births, marriages and deaths of her children. It's a good read. Names mentioned: Bacot, DeSaussure, Cochran, Thomson, Simons, Van Vorst, Gilchrist, Richey, Thomson. Notes: Underlines and other formatting are as written. Abbreviations have an added apostrophe instead of a superscripted final letter. My comments are in [brackets]. All my tyops have yet to be found. Easter Day, March 29 1891. "Thy Word is a Lamp unto my feet." Peter Bacot, (eldest Son of Thomas Wright B., (Son of Peter) and Jane B. formerly Jane DeSaussure, Daughter of Henry D.) intermarried with Mary Eugenia, (Eldest & only surviving Daughter of Charles Burnham Cochran, (Son of Robert C.) and Harriett Rachel, Daughter of Col. William Thomson of BelleVille S.C.) on the 6th February 1810. The Rev'd. Jams D. Simons Rector of St. Philip's Church, Charleston, performed the matrimonial Church service at the House of Charles B. Cochran. Mary Elizabeth, (2'd daughter) intermarried with Tho. Corbett Simons, Son of Rev'd James D. Simons, on 6th February 1833. Charles Burnham Cochran oldest Son, intermarried with Sarah Frances, youngest daughter of Sarah and John Van Vorst of Harsimus, New Jersey. at St Matthews Church by the Rev E. D. Barry on the 2d. June 1839. Robert Cochran, 3d Son intermarried with Mary, [third?] daughter of Frances & Robert Gilchrist of Harsimus, N.J. at the Reformed Dutch Church by the Red'd Mat's Lusk, on the 15th Sept'r 1841. Emily Harramond 7th daughter intermarried with John Van Vorst only son of John & Sarah Van Vorst at Grace Church Van Vorst Jersey City on the 10th of Jan'y. 1850. Emma Cecilia youngest daughter intermarried with The Rev'd. Thomas Richey* at Grace church Van Vorst Jersey City on the 7th Oct'r. 1858. *Rector of Mt. Calvary Church, Baltimore, Maryland. Peter Bacot, in Charleston S.C. on the 3'd. December 1788. [In margin] Dec'd. 2 Charles Burnham Cochran, in Charleston on the 16'th Novem'r 1812. 3 Thomas Wright, in Charleston on the 11'th December 1814. 4 Mary Elizabeth, in Charleston on the 28'th Febuary 1816. 5 Robert Cochran, in Charleston on the 16'th September 1818. 6 Charlotte Haskell, in Charleston on the 9'th March 1821. 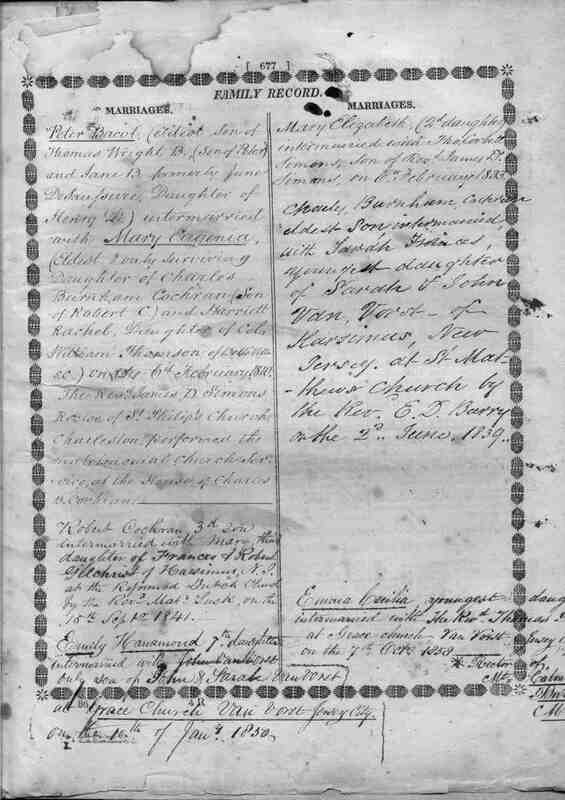 7 Eugenia Septima, in Charleston on the 23'd July 1823. 8 Eugenia Octavia, in Charleston on the 3'd July 1825. 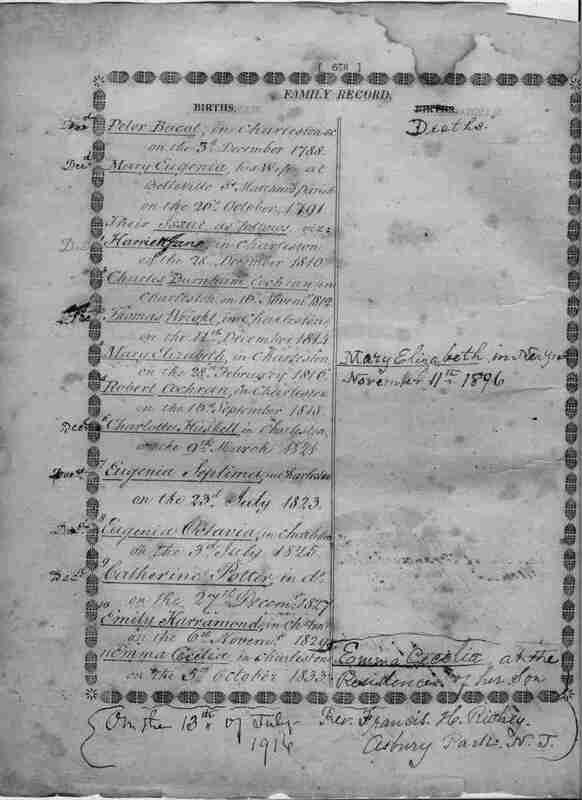 9 Catherine Potter, in do on the 27'th December 1827. 10 Emily Harramond, in Ch's'ton on the 6'th Novem'r 1829. 11 Emma Cecelia in Charleston, on the 5'th October 1833. 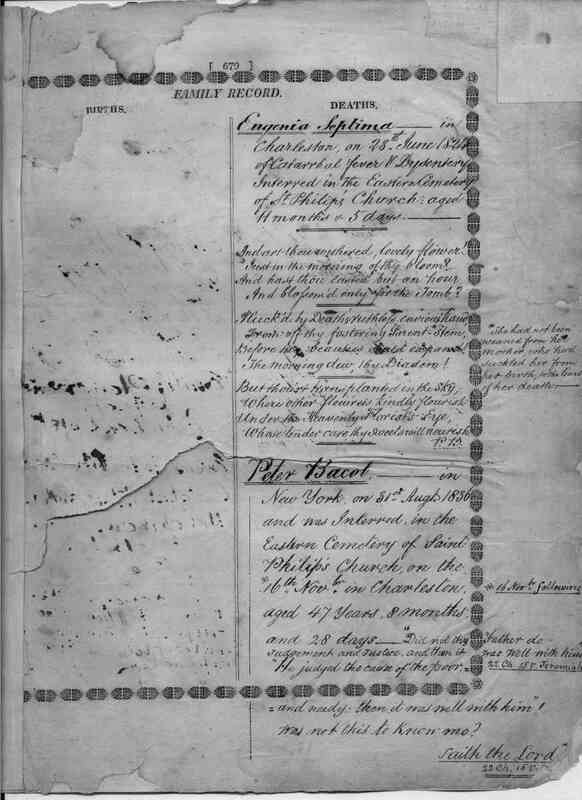 Eugenia Septima --- in Charleston, on 28'th June 1824 of Catarrhal fever & Dysentery Interred in the Eastern Cemetery of St. Philips' Church: aged 11 months & 5 days. And art thou withered, lovely flower! Just in the morning of thy bloom? And blossomed only for the tomb? Before thy beauties could expand! The morning dew, thy Diadem! Whose tender care thy sweets will nourish. Harriett Jane, at Baltimore on 13'th March 1859. Interred in the Cemetery at Orange, New Jersey: aged 49 Yrs, 2 months, 16 days. "The rest from thy labours." Charlotte Haskell May 11, 1889. Entered into life, aged 68 years 1 month and 11 days. "Rest comes at last"
Catherine Potter, Entered into life Nov 20 1887, aged 58 years 10 months and 0 days. "Whom the Lord loveth He chastisseth"
C. B. Cochran on 21 Aug 1833 aged 67 yrs 6 m's. H. H. Bacot on 13'th October 183[?] age 53 yrs 6 m.
Mary E. Bacot on the 30'th Dec'r 1847 aged 56 years two months and four days - died at the residence of her son Robert C. Bacot - Harsimus New Jersey. Emily Harramond wife of John Van Vorst. Entered into life Eternal October thirteenth 1902. "Her children a^rise up and call her blessed" Prov. 31.25. Passed away att the old Brinckerhoff Homestead, Freehold N. J. interred in the Van Vorst Vault in the Dutch Reformed Cemetary, Jersey City, New Jersey.